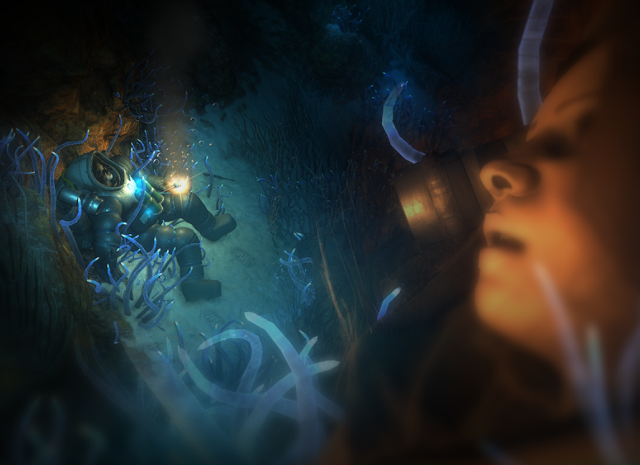 Narcosis does a great job of taking familiar elements found in most horror games and spins them into something a little new and different. The result is a somewhat short but ultimately satisfying horror experience that can be played on a standard computer monitor, but is even more effective when using an Oculus Rift. You have some pretty familiar design elements at play in the game, with blooms of light that try to push back threatening darkness, potential scares lurking just beyond corners you can't see around yet and some excellent use of sound to help create a feeling of terror even though your eyes do not yet see anything that is a threat to you. All of these are almost what you would expect from a horror game - atmosphere is key. 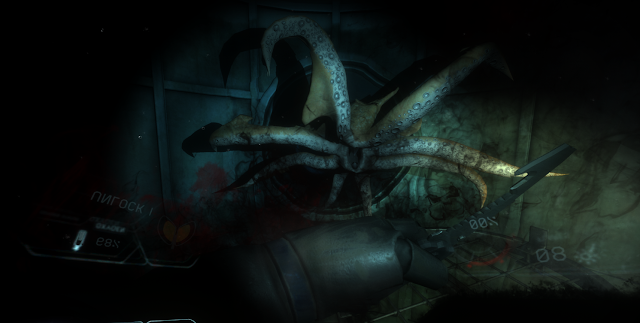 Some of the more common gameplay factors found in the genre get a nice shaking up however, in Narcosis. For one, we have a claustrophobic and dark environment, but instead of the hallways of an old house or asylum, our character finds himself stranded at the bottom of the sea. The story begins with the player getting a light tutorial experience in a training pool that teaches the basics of movement while explaining that you work for an operation that gathers frozen methane from the ocean. However, during what begins as a routine operation, an earthquake completely shakes everything up as platforms are dishevelled and underwater lighting is knocked out. Quickly you make your way out of the chaos and carnage into the base of operations you have been working out of; an underwater lab. It too is damaged, creating an interesting juxtaposition due to many narrow passages but also some unique underwater movement options. You walk and thrust along, forward and up, free to move about - so long as the passage has enough room for you to do so. There is water leaking everywhere, so it allows you to swim and look around freely while still having to contend with the confines of the sea lab and other passages to be traversed. Being stuck in this suit also changes how the gameplay plays out, similar to how health or sanity often get leveraged in games of suspense. Here you have to monitor your oxygen levels. If you get too close to the aggressive underwater creatures, you can fend (most) of them off with your knife, but this causes exertion on your diver's part. These creatures can and will hurt you - life is a factor, but I found the oxygen tank to be just as important and dangerous, if not more so. It can also cause panic, and these two things cause your use of oxygen to go up. This creates a sense of urgency throughout the game. Oxygen in and of itself is not such a precious resource that you have to rush through at the expense of being able to explore the environment, but it does keep you moving forward. This keeps Narcosis moving along at a pretty brisk pace that takes around four or five hours to complete. There are some collectibles along the way that can help to add a little more information to the overall story as you move about the slightly more than a dozen levels. You will find collectible items that relate to nearly two dozen character in the game, and these items do a nice job of fleshing these characters out and placing them within the context of the overall story. However, you are not simply moving around a dark environment. There are puzzles to deal with as well. 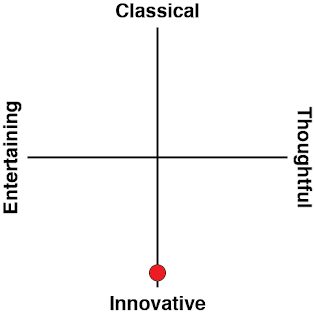 They all fit rather nicely within the context of the stages. 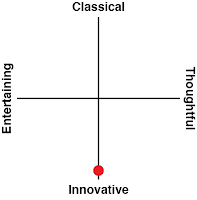 They are not ground breaking in any particular way, but they are carefully enough considered that they make sense. You are not simply aligning a bunch of stones to open some odd door, but restoring power that opens up more of the base. These combined with the critters and your limited air keep the gameplay tense throughout. You are not battling ghosts or zombies, but make no mistake: this is a horror game. The narrative is handled well enough, generally channelled through a narrator that is incredibly well voiced and suited to describing things that are or have happened along the way. They help to keep you on track, letting you know that you are progressing in the right direction. The voice has a smooth calmness to it that contrasts with the other major audio element in the game - your character's breathing. Tied to the aforementioned oxygen mechanic, your character's breathing will increase during moments of tension. It serves as a nice bit of immersive audio feedback that is only made more convincing by using a headset. In fact, to top off the entire presentation, I have to say that using the Oculus really makes the experience incredibly immersive. The ability to look around your environment and have the breathing right there in your ears amplifies the experience tremendously. There is even a nice parallel with wearing a set of goggles while in the game you are wearing a mask over your face. It all ties together rather neatly. There are a handful of small issues worth noting, however. For one, this is not a really long game, and that would be easier to forgive if the actual narrative was a bit more dense. Instead however, it is clear that the team stretched the content and story as much as they could. It is immersive, and it is interesting enough, but I never fully lost myself in the story though it did get stronger the further I got into it. As cool as the game itself looks with the Oculus on, I did notice the somewhat bland environmental textures and oddly animated creatures. The critters can look a little stiff and sometimes don't entirely adhere to the laws of physics as they clip through environments and move in sometimes awkward ways. Fans of survival horror should give this title a go, and this is especially true if you have the opportunity to experience it in virtual reality. 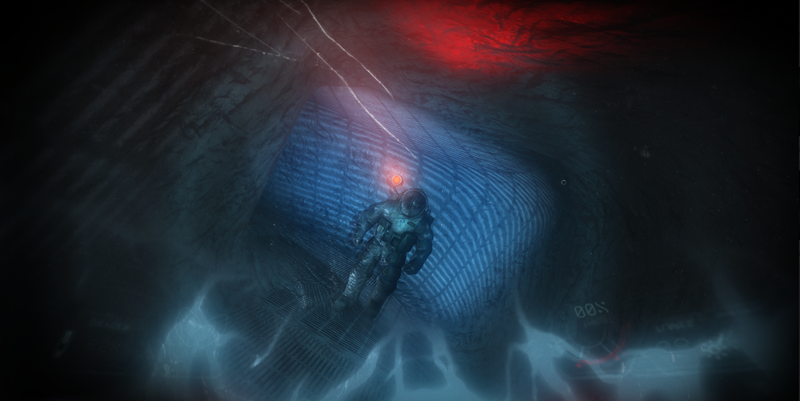 It may not have ghosts and goblins, but Narcosis still provides a suitably haunting experience worth undertaking.